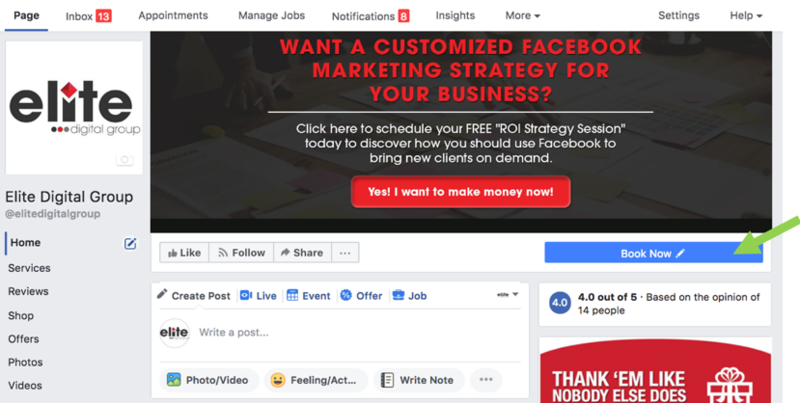 Facebook has made it easier than ever to help businesses who rely on appointments to make sales to fill their calendar with new prospects. This simple set-up takes less than 10 minutes (we timed it) from start to finish! 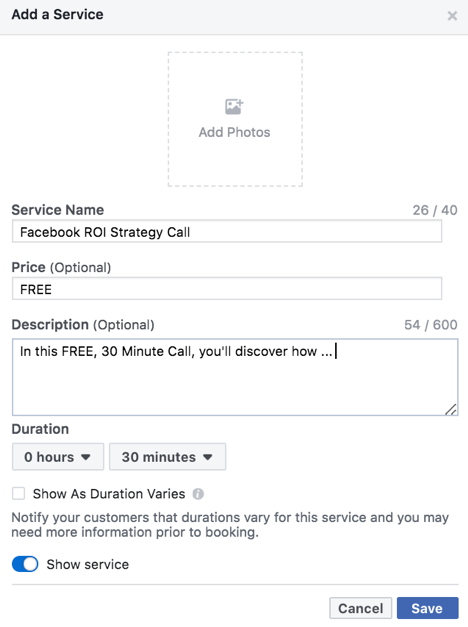 When a new prospect comes to your Facebook page, you want the desired next step to be as obvious as possible. 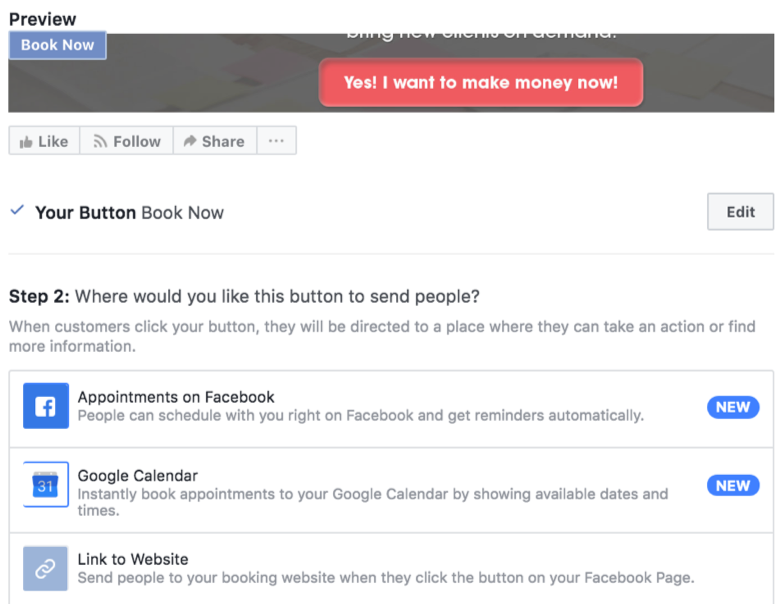 By creating a Book Now button that goes directly under the cover photo, you’ll give new visitors a chance to book an appointment immediately. Once they click the “Book Now” Button, they’ll be able to choose from select dates and times that you’ve already determined. 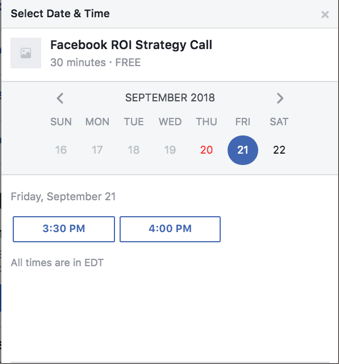 After they’ve selected the date and time that fits their schedule, they’ll be prompted to confirm and add any additional notes. After confirming, they will receive a follow-up reminder email giving them the date and time of their appointment. 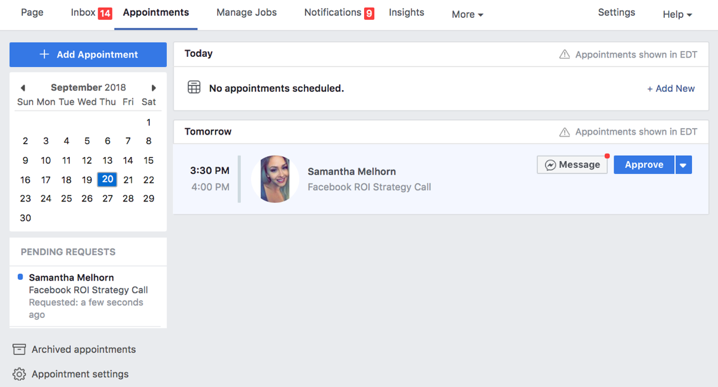 You will receive a notification alerting you of the new appointment on your page under the appointments tab. 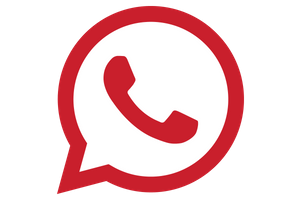 You then have the option to follow-up with then with next steps such as a video chat link, a phone, etc. 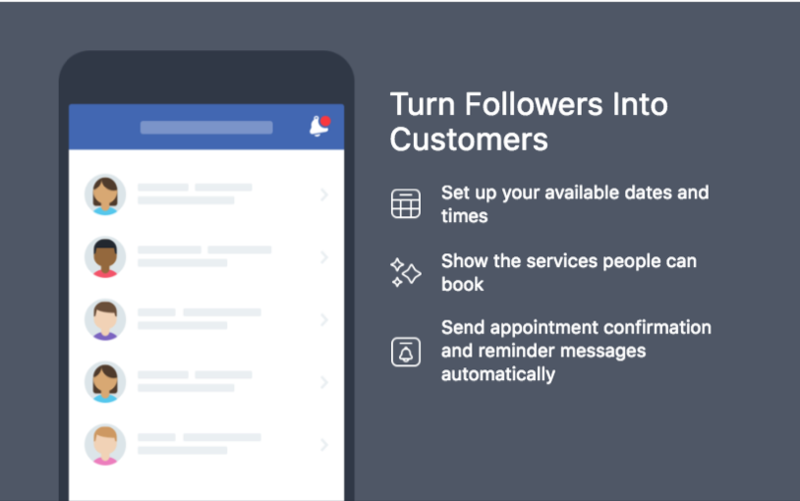 Here’s how to set-up your booking link so that you can quickly, easily and efficiently turn your followers into customers by allowing them to book appointments with you and your team directly from your Facebook page. If you have scheduling software or prefer to sync this button directly with your Google Calendar, you can do so by selecting one of the other options. 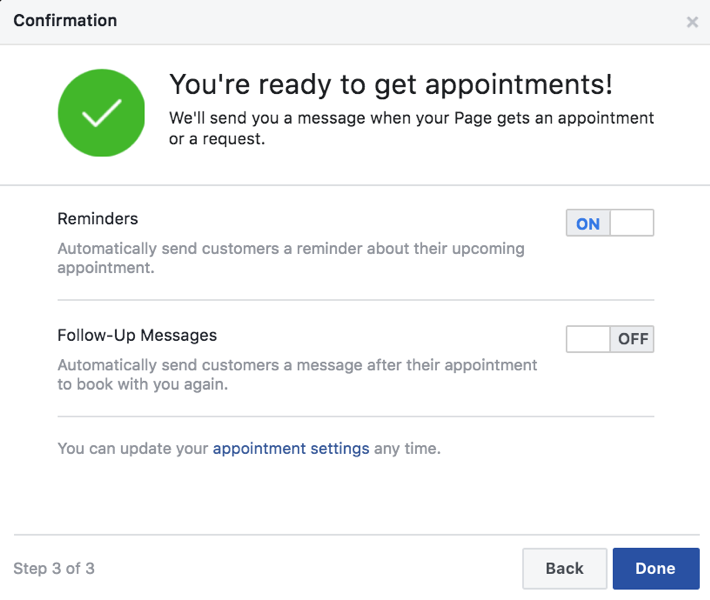 However, if you want to use the reminder notifications feature, you’ll have to use the “Appointments on Facebook” option. 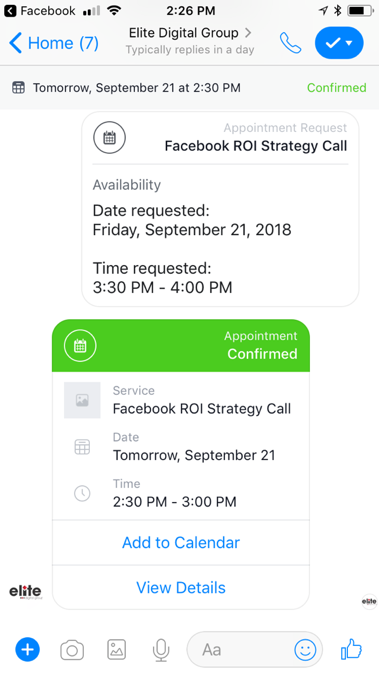 Control how much advance notice and how far in the future your prospects can schedule appointments. 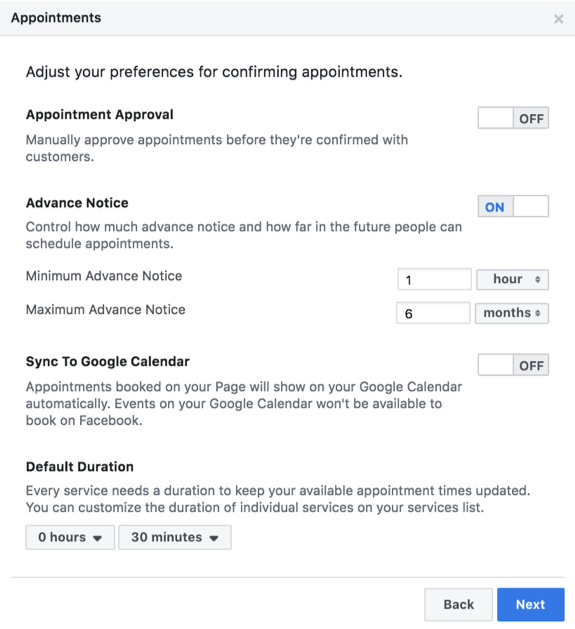 You also have a second chance to sync your appointments to your Google calendar so they show up automatically. NOTE: If you choose to add a price, payment is not yet able to be accepted at this stage. Step 6: Turn on Reminders (And Follow-Up Messages if Applicable) and You’re Ready to Go! 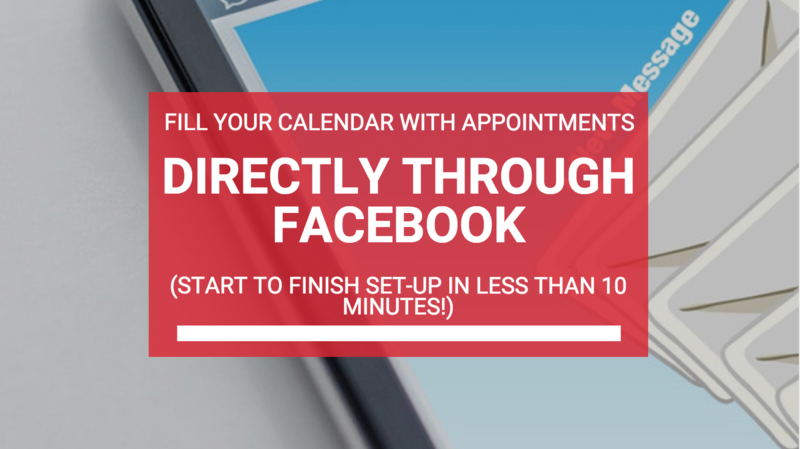 Want a faster, easier way to get qualified appointments hand-delivered to you month over month? 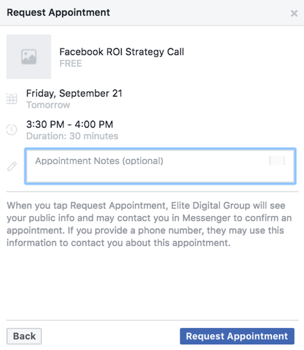 Click here to book your FREE ROI Strategy Session with our team to discover how the EDG Social Appointment System™ can work for your business. You have given good statements and directions. Action taking and being responsible towards prospects is important. Your treatment of the prospect is more important than what your selling.